Morning all and welcome to the most murkiest time of the year – the January transfer window. It’s a time in which rumours are rife and agents get paid and let’s be honest although we all like shiny and new things it’s a time in which people get a little bit more tightly wound, are susceptible to rumour and as a result get a little more angrier. And we’ve already kicked off this window with a host of fluff of which very little is to be believed I hope. But some of which has to be believed because we’re hearing from the horses mouth. First and foremost, existing players at the club and it appears as though Juve are making the eyes at Aaron Ramsey. This is to be expected because he’s on his way out in the summer and so can speak to any foreign club. He’s always talked about moving abroad to play his football and when a club as successful as Juve express their interest then it is inevitable that he’s going to listen. It does beg the question about why we got in to this mess in the first place and you can’t help but look at the Özil situation and think there isn’t some kind of link. Özil played the long game, the club blinked and paid him what he wanted, then it set a precedent for future negotiations. Because Arsenal are a club under the old regime that had left the negotiations of new deals until 18 months before they were due to expire they found themselves frequently on the back foot with players. Ramsey’s team clearly thought they could play the long game, it didn’t work out, so the club stopped negotiations. 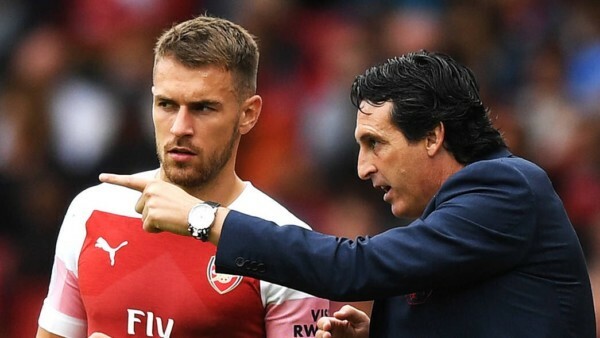 Whether or not it’s what Ramsey’s agent wanted in the first place I’m not sure, but Arsenal weren’t going to get backed in to the corner over another deal and the new management team have taken the stand. I guess it’s all about timing and the timing was right for Özil’s agent to capitalise on the instability at the club last January. And almost a year later he’s in the papers again talking up how much Mesut wants to honour his contract. Well, who wouldn’t, when they’re earning best part of £1.5million a month? I’ve always said I’m a massive fan of Özil. I’ve talked about his ability and how we need an Özil on song to be the best team we can. But regardless of whether Emery wants the player or not, his wages and the lack of interest from other clubs – which also is probably in part due to his wages – means that this situation shows no sign of changing. We just have to hope that there can be some kind of form found by the German and that Unai finds a way to get the best out of him between now and the end of the season. The rest of the stuff surrounding the club at the moment is all spurious rumour. Talk of Nicolas Pepe is silly. Arsenal May be interested but with a decent length of contract behind him and plenty of other clubs sniffing, he’ll be a big money move, which is not something Arsenal will be looking at in a January anyway. Perhaps there’s a move to be done in the summer if Arsenal have the cash, but I doubt it’ll be this January and even so he’s a young player who would maybe need time to adjust, so pinning hopes on someone like Pepe is hardly going to see a massive change at the club. What we need is defensive reinforcements and particularly if Emery continues with three at the back. We’ve been linked with Gary Cahill on loan and whilst I wouldn’t be averse to the idea based on the fact he’s an experienced body who could form a good squad rotation player for five months, it does show that we’re shopping in the cheaper aisles at the moment; looking for deals to tide us over rather than kick us on. And that’s not exactly filling this Arsenal fan with hope that we are going to see any massive changes this season certainly. We always knew that it is going to take Emery time to build ‘his’ team but whereas many are saying ‘a couple of transfer windows’, it feels like that needs a caveat right now of ‘except the January ones’ because it doesn’t sound like too many stylistic changes can be made if you’re looking at loan deals for the likes of Gary Cahill. I guess we have to just accept it for now. Unai has to work with this crop of players. He needs to get the best out of some of those players who aren’t performing and he probably doesn’t have the luxury of being able to completely marginalised some players that he just doesn’t fancy. BUT STILL IF YOU SEE CLUBS LIKE MAN CITY AND LIVERPOOL ,tHEY HAVE ALMOST 3 PLAYERS PER EACH POSITION WHICH MEANS WE ARE STILL LACKING A NUMBER OF PLAYERS TO BRING IN FOR US TO COMPUTE FOR THE LEAGUE POSITION 4 EVEN THEY ARE SERIUS IN MARKET.